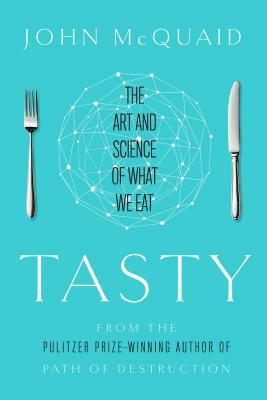 A fascinating and deeply researched investigation into the mysteries of flavor—from the first bite taken by our ancestors to scientific advances in taste and the current “foodie” revolution. Taste has long been considered the most basic of the five senses because its principal mission is a simple one: to discern food from everything else. Yet it’s really the most complex and subtle. Taste is a whole-body experience, and breakthroughs in genetics and microbiology are casting light not just on the experience of french fries and foie gras, but the mysterious interplay of body and brain. With reporting from kitchens, supermarkets, farms, restaurants, huge food corporations, and science labs, Tasty tells the story of the still-emerging concept of flavor and how our sense of taste will evolve in the coming decades. Tasty explains the scientific research taking place on multiple fronts: how genes shape our tastes; how hidden taste perceptions weave their way into every organ and system in the body; how the mind assembles flavors from the five senses and signals from body’s metabolic systems; the quest to understand why sweetness tastes good and its dangerous addictive properties; why something disgusts one person and delights another; and what today’s obsessions with extreme tastes tell us about the brain. Brilliantly synthesizing science, ancient myth, philosophy, and literature, Tasty offers a delicious smorgasbord of where taste originated and where it’s going—and why it changes by the day. John McQuaid is the author of Tasty: The Art and Science of What We Eat and his journalism has appeared in Smithsonian magazine, The Washington Post, Wired, Forbes.com, and Eating Well magazine. His science and environment reporting for The Times-Picayune anticipated Hurricane Katrina, explored the global fisheries crisis and the problems of invasive species. His work has won a Pulitzer Prize, as well as awards from the American Association for the Advancement of Science, the American Institute for Biological Sciences, and the International Association of Culinary Professionals. McQuaid is a graduate of Yale. He lives in Silver Spring, Maryland, with his wife and two children. "McQuaid explores how deliberate manipulation of flavor influences virtually every aspect of the human experience, from pleasure to pain, from joy to sorrow. This is an awe inspiring landmark book, one that clearly deserves several readings." "Pulitzer Prize-winning journalist McQuaid offers up with gusto this fascinating and meticulously researched consideration of flavor and the sense of taste...Tasty is an appetizing and satisfying chronicle of what we know of taste, so far. An excellent (and relatively agenda-neutral) choice for those who enjoy Michael Pollan and Gary Paul Nabhan..."
“Early on in this excellent and absorbing investigation into the origin and nature of taste, John McQuaid promises that the book will be “a brief biography of flavor…If I imagined a whiff of hubris in McQuaid’s ambitions, the Pulitzer Prize-winning journalist certainly proved himself up to the task, distilling and presenting in lively and entertaining prose a dizzying amount of scientific and cultural research throughout…"